A few days ago we crossed the boarder into New York and to what we hoped would be a new landscape, new terrain, new something… What did change right away was the trail building, our second day into New York was probably one of the hardest days, physically, on the trail. It was straight up one boulder pile and down another. My legs were immediately jello. It might surprise you that our legs would ever feel like jello at this point, I mean we just walked 1,300 miles, shouldn’t we be in the best shape of our lives? However, the elevation profile has been rather flat lately and our legs were out of climbing practice. Luckily the next few states slowly work us back up to the mountains we will be climbing in New Hampshire. 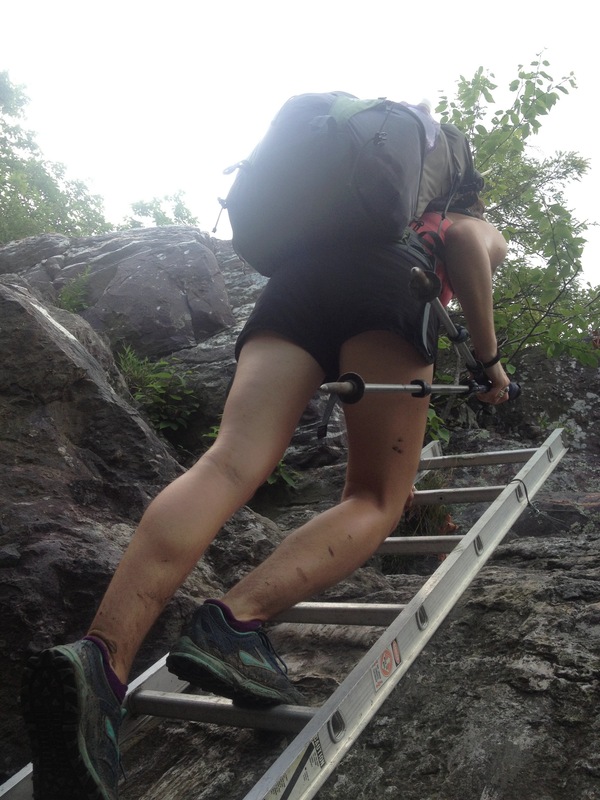 In spite of the terrain being hard we managed to hike some very long days, trying to stick to a schedule in order to get to Great Barrington to meet my mom and Arlene Hartman who are coming out to visit us (yay)! In order to do long miles we were having to hike from seven in the morning until nine at night. For some reason everyday seemed to be taking so long. We couldn’t speed up, but we were relieved to find out we weren’t the only people on the trail that seemed to feel that way. Everyone seems to be dragging and we all seem to be wishing we would get our second wind and our energy back. But as we kept pushing it was becoming apparent that something really was wrong. We kept meeting more and more people that had been diagnosed with Lymes Disease and every symptom sounded like how Kyle had been feeling lately. Suddenly we were looking at a circular shaped rash on his upper thigh a little differently, maybe it hadn’t been caused by chaffing. So we made the very hard decision to slow down considerably and stop in Kent for a few days to recover. You cannot imagine how hard it is to slow down, for a thru hiker slowing down is the hardest thing to do. Kyle was still convinced it was just fatigue and muscle weakness from overuse but I was convinced he had Lymes Disease. As soon as we got into Kent I got on the phone and got him a doctors appointment, despite his refusals. The doctor confirmed my fears and Kyle was given twenty one days of antibiotics to combat the Lymes. We have been relaxing and recovering at the Amselhaus, an adorable apartment in Cornwall Bridge, CT. We are very excited for our visitors to arrive tomorrow. Their timing is perfect because it will keep us hiking slower for the next few days, giving us more time to rejuvenate. It’s probably hard to imagine how anything out here could be stressful, we don’t have deadlines or requirements, but we are human and so of course we force those things on ourselves. The hardest thing is to throw off all those expectations and just do what we want and what we feel. It’s a constant interplay, we plan, we feel stressed, we throw all caution to the wind and try to just be happy. I guess just like real life, but with a few less outside restrictions. This is all part of that “hike your own hike” saying that so popular on the trail but so hard to actually enact. If we can learn to hike our own hike out here I think that will only make us better at living our life the way we want to back in the “real world”. Now enough of the philosophical BS, here’s a picture that should give you a taste of the NY terrain. I’m Keith Scott. Bob and Shelby’s son. My Mom sent me the link to your blog. Sounds like you guys are having quite an experience. Am enjoying your posts. I read that you have Lyme’s. Please do not take it lightly. My youngest son has tested positive for Lymes and it has been a 2+ year nightmare / ordeal. We have seen many doctors, some good some awful and I can tell you that 3 weeks of anti-biotics is not enough. Most Lymes literate Doctors recommend 5-8 weeks of an initial course of anitbiotics. It is very hard to get out of your system. I don’t want to be an alarmist but read up on it and good luck. I hope it goes away easily and quickly for you. Good luck on the rest of your journey!! Thank you for your concern Keith! We are absolutely terrified of Lymes and even more worried about how convoluted and confusing the information about it seems to be. We will both be getting blood tests done after the trail just to check out our systems and see where we are, make sure everything is taken care of. In the mean time we are carefully monitoring our health and reading a ton of information on the disease! This will be a great birthday treat for you Lindsey. Sorry to hear about the tic and illness. Hope you feel better Kyle. New York already. I am sure that isn’t how it feels for you both but what an accomplishment. Nice to see you in tennis shoes, looking strong. Have a great day on the 22nd. You are loved and thought of as you get a bit of a reprieve. That really makes me excited to get there – not!!! I just hiked Staircase, now you are showing me ladders. Oh, well, as we have been saying over here- one foot in front of the other, that is all we have to focus on. I am so excited to get there – just hours now until we board that plane and less than 18 hours before we see you guys.